Collection enforcement and lien filing on behalf of association. Keep records and allow easy owner access via website to all correspondences, rules & regulations, and all other association related business and documents. Regulation and enforcement of property rules and regulations. Act as a buffer between the owners and tenants in the case of rule enforcement. Provide a 24/7 emergency contact for any common area situations. Representation of property interests in community matters. Represent the property's interests in legal matters where applicable. Provide background information and even testimony, if necessary. Tenant education about state or industry regulations pertaining to such matters. Local assistance with owner real estate transactions (tours, inquiries, mortgage lender questions, etc.). Effective communication in every aspect of our Commercial Association Management Service is vital. To best meet this need Resort Group has built a custom designed and proprietary website exclusively for our property owners and owners associations. This secure, password protected site allows access to association documents including declarations and by-laws, meeting notices, minutes, board rosters, management reports, as well as, convenient links to real estate transactions, plus informative answers to frequently asked questions. 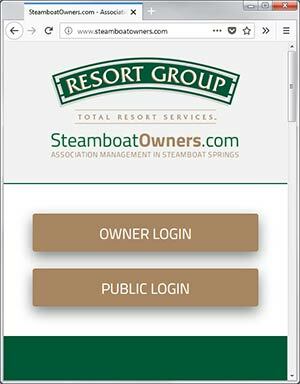 All of this information is available 24/7 at the easily remembered website www.SteamboatOwners.com. Our proprietary association website system built exclusively for our property owners and owners associations.